1) wash and soak rice for 20 mins . 2) add 1 spoon of salt and cook rice till almost done . 3) Strain out and spread on paper towel or on a plate so that all moisture will evaporate . Meanwhile chop all the vegetables in required sizes and onions into thin long pieces. 1) Heat oil in a flat pan, add cumin seeds onions and half of the salt you are required. 2) As the onion become golden brown then only you add ginger garlic paste and green chillies. 3) After one minute add all the vegetables and saute them for a while. 4) Add salt and allow it to cook on slow flame . 5) As the all the vegetables nicely cooked. 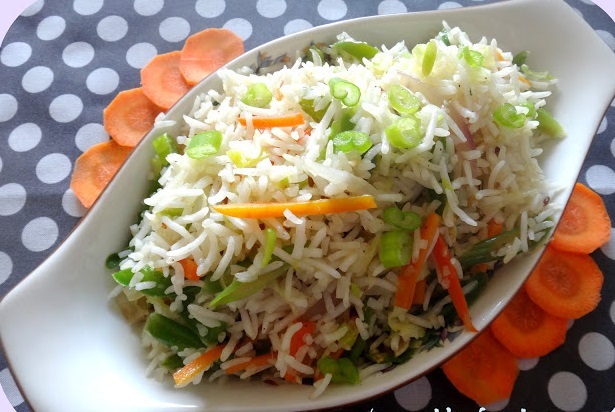 6) Sprinkle coriander leaves and add rice to it and mix well. 7) Check for salt and keep it on stove till all mixture become warm.